Agency In A Box, the easiest way for agencies to submit job posts and receive job applications. The client came to us with a whole new perspective of job hunting, which was by connecting directly with the employees and job seekers with the recruiting company. Agency in a box was bridging distances and destroying obstacles for those who are looking for the next opportunity. Agency in a box is a comprehensive online platform where stakeholders connect and collaborate with job seekers. The brand had the potential to be great but when they approached us it lacked a personality and an identity. Plexable's challenge was to create and build a brand and web and mobile app experience that captures the psychological personal impact of the brand on all platforms. We managed to connect the dots, but the different user types had a say in every part of this application, which made us create different journeys yet giving the same emotional values in every step. 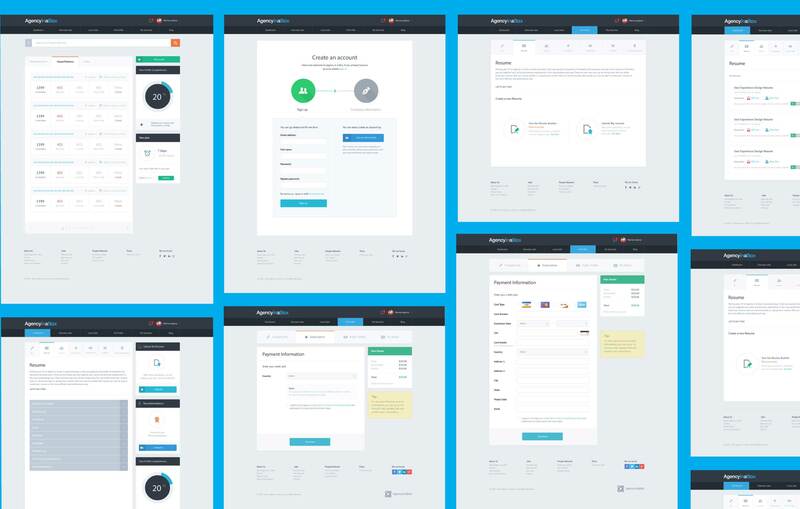 Moreover, we knew that the functionalities of the Web app had to match the mobile experience, that’s why we tried to convey the user's journeys first and then implement them parallely on the web and mobile wireframes and design. Wireframing is an extremely important phase of the web development process. The wireframe dividends between conceptual site planning and the actual development of Agency In a Box. It helped us to create more efficient architecture, and the time and effort we spent was rewarded by getting more solutions and creating a better experience for the users. The design team had it easy! After we conducted the user stories, the research and gathered the client requirements. 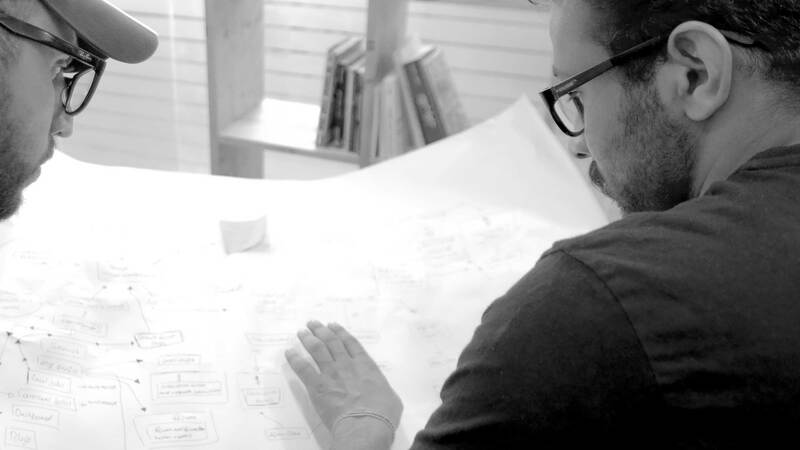 They started working non-stop to produce the most suitable user interface and information design for Agency In a box. We treated every user as if he/she was a stranger to the web to reveal the uncertainties and develop ways beyond them. During our user testing interviews, we found out that the job seekers wanted to stay alerted at all times. We suggested to address this struggle with the client and agreed to create a mobile app for users. 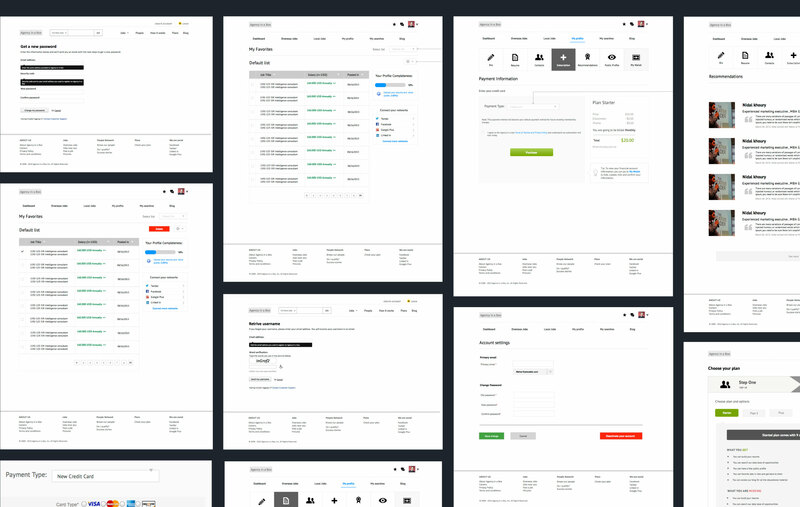 We started by sketching a wireframe that serves the users on the move, reducing the clutter of the web application and worked to achieve an easy thumbs interaction with the application.